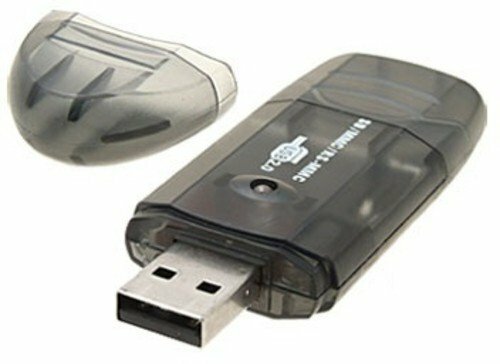 High speed USB 2.0 SD/ card reader and writer. Nice design with 2 protective covers. Support SD , Mini SD , MMC , RS-MMC. Read and write the data from the your cards at 480Mb/Second, enjoy the amazing speed. High speed USB2.0 - High speed USB 2.0(backwards compatible with USB1.1). High transfer rate of up to 480Mbps. enjoy the amazing speed. Multimedia Card - Supports T-flash card, Micro SD card, SDHC card. LED indicators - LED power/status indicators light. Lightweight and Portable Design - Nice design with 2 protective covers, which is ideal for portable use on the road or at home with a desktop or laptop. Plug & Play - Simply plug in to your PC to start transferring photos, data or music. 100% quality warranty.